Congratulations to "Trude V.", the winner in Connie's giveaway. Thank you to all who participated! People often tell me I have the coolest job in the world, and I’d be the first to agree. Not only do I get to write romantic suspense, but for the past ten years, I’ve also been a USCG-licensed boat captain. When I’m not wreaking havoc on my characters, I pilot a boat for our local school board. I take 24 students at a time down the crystal-clear Silver River here in Central Florida and get to show many of them their very first alligator. What fun to see them get excited about nature and our abundant wildlife. The greatest compliment in the world is when a 5th grader steps off the boat and whispers, “That was the best field trip ever! After ANGEL FALLS came out several years ago, readers started asking me to write a boat captain into a story. So when the idea for TANGLED LIES began niggling at the back of my mind, I decided to set the story around a small Florida marina and make the heroine a boat captain. I had an absolute blast writing Sasha’s story, though people regularly ask if she’s me. Oh, no. She’s far braver than I am, and has her own personality, quirks, and insecurities to fight. The idea of three foster sisters came from my nephew and his wife, who are foster parents. The sisters come back to Florida for their mother’s 60th birthday, only to have her ask the impossible. She wants them to find Tony, her biological child who disappeared years ago. Sasha dives headlong into the challenge, willing to try--though uncertain where to start. She isn’t prepared for the temptation of yummy Jesse Claybourne, the bad-boy rich-kid of her high school fantasies. He’s back in town on a quest of his own and it doesn’t take long before they realize someone in this small town will stop at nothing to keep their secrets safely hidden away. What do you do when you’re not reading (or writing) romantic suspense? 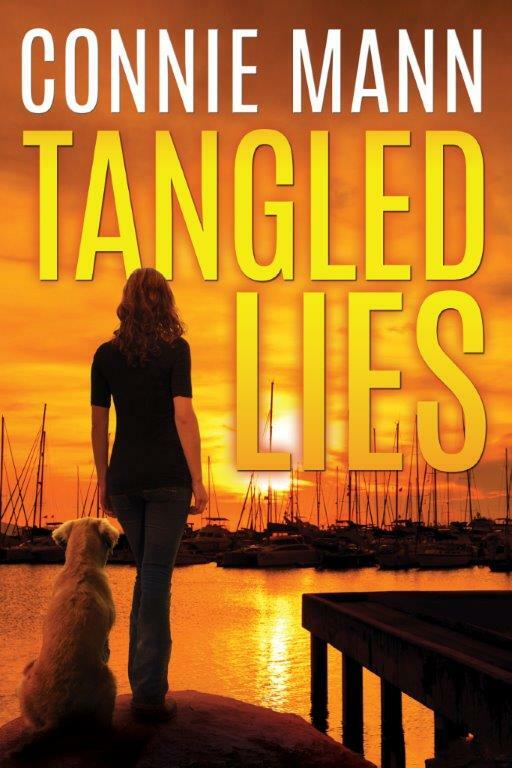 Leave a comment telling me about your day job and you’ll be entered to win a print copy of TANGLED LIES. Some family secrets are best left buried at sea. Orphaned as a child in Russia, boat captain Sasha Petrov has spent most of her life adrift, anchored only by her loving foster family. So when they beg her to return to the family marina in Safe Harbor, Florida, for Mama’s sixtieth birthday, Sasha complies, hoping to put the past behind her. But Mama has other plans: she wants her three foster daughters to find Tony, the biological son who disappeared twenty years earlier. Sasha agrees to try, but that’s easier said than done when bad boy Jesse Claybourne shows up, reigniting an old attraction. Back in Safe Harbor on a quest of his own, Jesse gets tangled up in Sasha’s search, and soon the two are close to uncovering an old town secret that some will stop at nothing to protect. When Jesse is violently beaten and Sasha’s dog is poisoned, they realize the past is hiding something more sinister than they ever imagined. Can they uncover the truth without destroying Sasha’s family and breaking each other’s hearts, or are they sailing against the wind? Connie Mann is a licensed boat captain and the author of romantic suspense novels Tangled Lies (May 2016) Angel Falls and Trapped! as well as various works of shorter fiction. She has lived in seven different states but has happily called warm, sunny Florida home for more than twenty years. When she’s not dreaming up plotlines, you’ll find “Captain Connie” on Central Florida’s waterways, introducing boats full of schoolchildren to their first alligator. She is also passionate about helping women and children in developing countries follow their dreams and break the poverty cycle. In addition to boating, she and her husband enjoy spending time with their grown children and extended family and planning their next travel adventures. You can visit Connie online at www.conniemann.com. Check out the JRS SHOWCASE for additional giveaways! I don't have a day job...I'm retired, so I spent do a lot of time reading. Romantic suspense is my favorite genre. When I'm not reading, I spend time with the grandkids. We do a lot of day trips to places. School is about to start up here, so my reading time increases. I'm delighted to be here! Thanks for stopping by to say hello. Trude, I'm a teensy bit jealous. I look forward to the day when I can spend more time reading--especially romantic suspense! TrishJ, How fun. I love that you're involved in your grandkids lives. Happy reading once school starts again. Hello, Connie! I retired 2 years ago so my day job is reading books and then writing reviews. This has been my favorite "day" job ever. I also enjoy taking walks to prevent myself from becoming a couch potato. However, I do take along an audio book while I walk. I'm jealous of all the retired folks! I've still got a few (okay lots) years to go in my job. I work writing regulations. I love it even though most would probably find it boring. I left my job to become a home care provider for my parents. That is an incredible gift you are giving them. Caregiving is not easy. They are very lucky to have you. I'm retired. So my day job is now gardening, visiting relatives and friends, and I do some babysitting(dogs too!) Also, lots of reading! Betsy, sounds like you have the perfect schedule--except gardening. Sadly, I am an unintentional plant killer. Hardest job in the world, imho. Good for you, Linda! I am semi-retired. I work with young children. In my leisure time I do love to knit. Sounds lovely, Mary. I've never learned to knit, but have always wanted to. Maybe someday. So happy to meet you, too, Janice! Thank you for caring for your husband. I have beloved family members dealing with that, too, and it's so hard. Glad you are able to escape the challenges for a while with good books! Good for you, Rachael! It can be tough, but oh, so worthwhile! I live in a small town at the centre of South Africa's main cattle farming area. I am an accountant and most of my clients are farmers. My work is a lot of paper and numbers and a lot of hours in front of a computer. So nice to 'meet' you Linda. Wow, you're a long way from where I live. Cool!